Jane Jones did brilliantly to translate Lorca’s Spanish text into dialogue which made sense to an English suburban audience, even if the play, set in rural Andalucía before the civil war seems to have a greater resonance with modern Islam than 1930’s Christianity. She did equally well to slice the play into three acts, giving the audience two interval breaks away from the angst of denied feminism and repressed sexuality, which is the theme of this, Lorca’s last play before his murder in his home near Granada by forces loyal to Franco in 1938. The theme does not seem to me to be so much a criticism of an unforgiving Church, or even of the unfairness of life in this (still) poverty smitten part of Spain, so much as the preservation of so called family honour. Whatever happens, do not let the neighbours know what life is really like behind the firmly closed doors of the house of Bernarda Alba. Was I the only one who thought it got off to a slightly hesitant start in Act1? However, once the funeral party of five grieving daughters and a matriarch as tough as old boots entered, the play became electric. 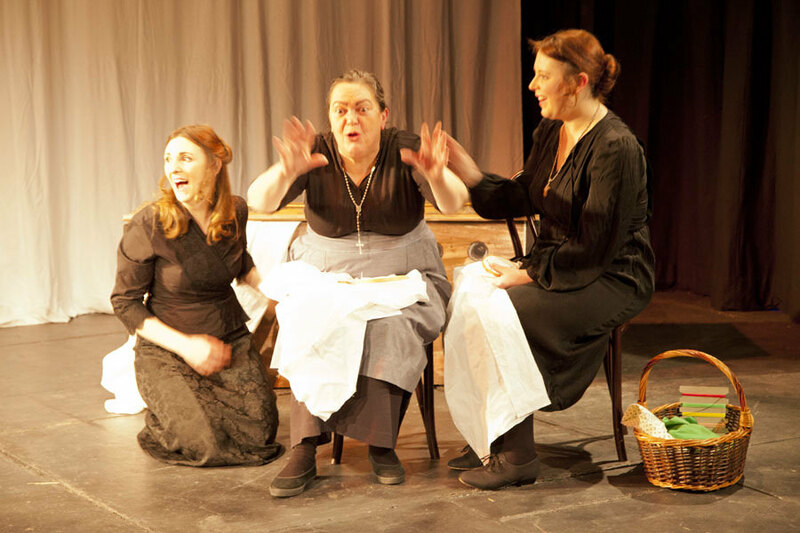 Lydia Dickie, as the housekeeper, Poncia, who brings to the play its only vestiges of humour, got splendidly into her stride with her interaction with her employer/confidant. 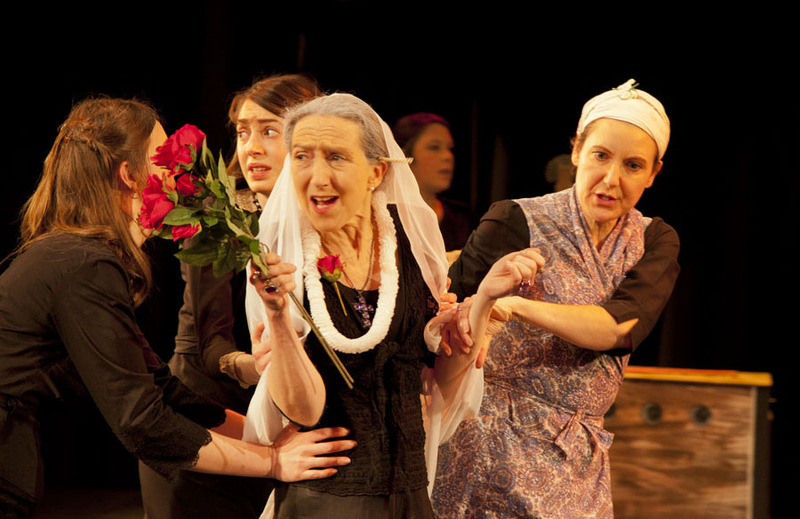 Lynda Hansom’s stunning performance as Barnarda, newly widowed and with a houseful of unmarried daughters, is full of poisonous observations, disdainful put-downs and a totally obscured sense of moral duty. She would, I suggest, turn away any prospective son-in-law. Not so apparently, the local Lothario, Pepe El Romano, the unseen handsome chancer, keen to get his hands on the dowry of the unattractive left-on-the-shelf eldest daughter Angustias, played by Louise Temple who portrayed this difficult role so well. Angustias, who is the daughter of her late father’s first marriage, has been more favoured by him (for whom, incidentally, Bernarda orders the entire household to go into eight years of mourning), that he leaves her considerably more in his Will than her step-sisters. Raging like the stallion heard off-stage, Pepe causes the hearts of two of the other sisters to flutter. Adela, the youngest daughter, ably performed by Lily Sida-Murray, is the real object of Pepe’s attention. Smothered by the oppressive atmosphere created by convention and maintained by her mother, she rebels and responds to the temptation. In so doing she sparks intense jealousy from her sister Martirio also so well played by Emily Dickie. Sophie Taylor and Abigail Ross-Jackson as the two remaining sisters, Magdalena and Amelia, have less to say but by expression and movement convince us of the nightmarish existence they lead. Needless to say, it all ends in tears. 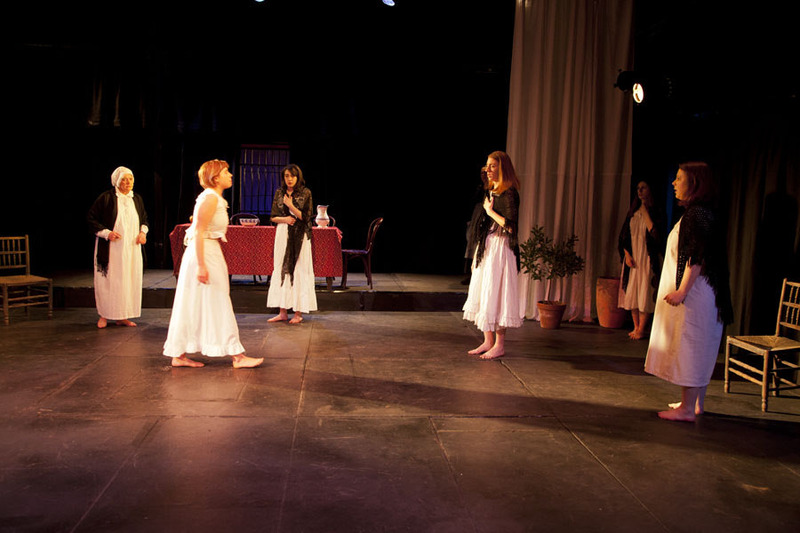 Bernarda takes a pot shot at Pepe with a rifle for chasing the wrong daughter. The disgraced Adela, thinking him dead, hangs herself. Bernarda, who is a rotten shot and misses hitting Pepe, keeps up appearances by pronouncing that her youngest daughter is still a virgin in order to silence the neighbours and everyone else sinks into deeper misery. A perhaps odd note which strikes this critic, is the part in the play of Maria-Josefa, the old and deranged grandmother stoically and reliably played by Tracy Brook. The character seemed superfluous to the story. Perhaps Lorca should have cast her as spinster aunt which would have made more sense. The remainder of the all-women cast was ably filled by Sharren Taylor, Nicola Watson, Judy Douglas, Annajane Glyn-Sheppard and Georgina Hickleton. So who needs men? Well actually there were quite a few of them involved in sound, lighting, and set design; all overseen by another squadron of able women. 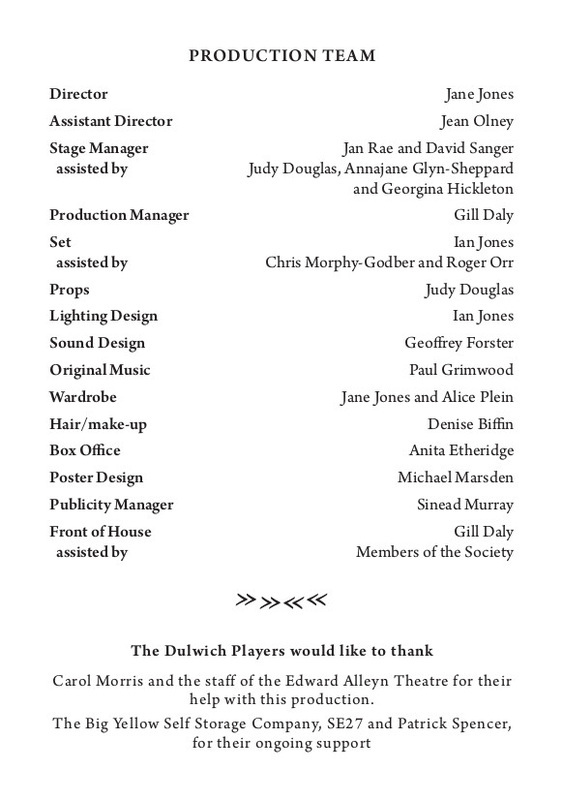 Congratulations to directors Jane Jones and Jean Olney for maintaining the brooding atmosphere and good pace, and the cast for such fine performances.